This entry was posted in Crime, Team Kimberlin, Trolls and tagged Dreadful Pro-Se Schmalfeldt by wjjhoge. Bookmark the permalink. Occam’s Razor can be quite sharp. In some cases, Occam’s shoehorn is sharper than CBBS. Your average bowling ball is sharper than Witless Willy the Weeper. For someone who is disabled he sure is digging a deep hole. The more one stirs a bucket of horse poop, the worse it smells! A fitting epitaph for ACME Law! Perhaps the strongest proof that something is so is William’s saying it isn’t. And in just six days, he’ll be “convicted criminal Bill Schmalfeldt.” Is everyboy as excited as I am? No, no, no- go big or go home. “Convicted cyberstalker and harasser Bill Schmalfeldt” is more appropriate. Less accurate. The charge is contempt of court. No, this charge is violation of the peace order. Funny innit that the Lickspittle/Zombie horde has difficulty keeping track of Schmalfeldt’s many court dates and charges. I’m sure Bill has no such trouble since none of the Lickspittle/Zombie horde are being charges with violations right and left like the Elkridge Horror. “Convicted of multiple felonies” is a moniker that hasn’t slowed down Brett Kimberlin and it won’t stop Bill Schmalfeldlt either. His narrative of his own life will alternate between Walden and Hugo. What will stop Bill Schmalfeldt is taking away his access to the internet. That’s what to which I aspire. I wonder if the letters in the envelopes he sent to Judge Grimm have forged signatures? 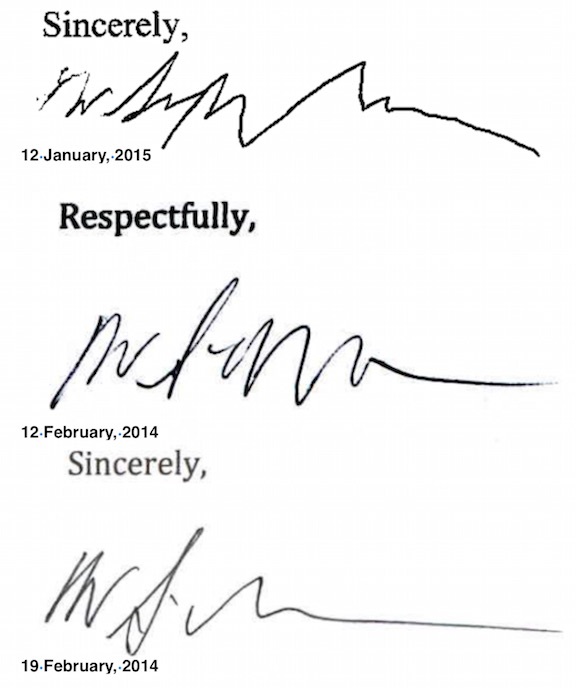 I suppose those letters to the court would have printer sigs/watemarks. He admitted at the time that he sent them, and claimed that WJJH’s mention of his name in a responsive motion to a BK filing invalidated their settlement agreement. — William Smellfart, Twitter Attorney at Law, collector of multiple court orders from multiple states for harassment and stalking. I admit I am morbidly curious as to the origin of those (apparent) head injuries in the picture. His skull also looks curiously distorted on the left side, almost like a bad photoshop… except I have a feeling it’s not. I think those are the incision sites for the “experimental” deep brain stimulation (DBS) procedure. I think Bill got a toaster for being the 30,000th patient to undergo the process; so the “experimental” needs an asterisk to point out that the “experiment” was to see if the proven technique would, in fact, provide a reduction in symptoms for early stage Parkinson’s sufferers. All credit to Vanderbilt Medical, but it seems to have worked. Bill exhibits very few symptoms, which when contrasted with his constant victimhood and the way he waves his PD around like a badge of honor, have lead some to mock him (not the disease) as a poser and a whiner. Either that or scars from failed lobotomies. The soul-less eyes and maniacal leer… well they speak for themselves. The truth was spoken. Pity that he never reflects upon this. Bill Schmalfeldt’s level of twitter abuse has dropped off greatly over the past couple of weeks. I’m guessing he has finally realized how bad of a legal position he has set himself in. As I said, I’d love to be in a position for a road trip next week. However, I’ll enjoy the lessened quantity of vile tweets towards myself and the other Lickspittles. I was going to blow it off, but in light of recent developments, I may have to check my schedule for movable appointments. Bill is, sooner or later, going to learn that publishing a daily stream of violent sociopathic and homophobic threats is not in his interests. The real pushback is only just starting. When a Google search ultimately produces results close to 100% that consist of BS discrediting himself with his own words even he may start getting the message. His real problem right now is that there’s years of his logorrhea out there- some of it far more sick and twisted than most anything he’s saying currently. And we have it all, Bill. Three years? More like ten. 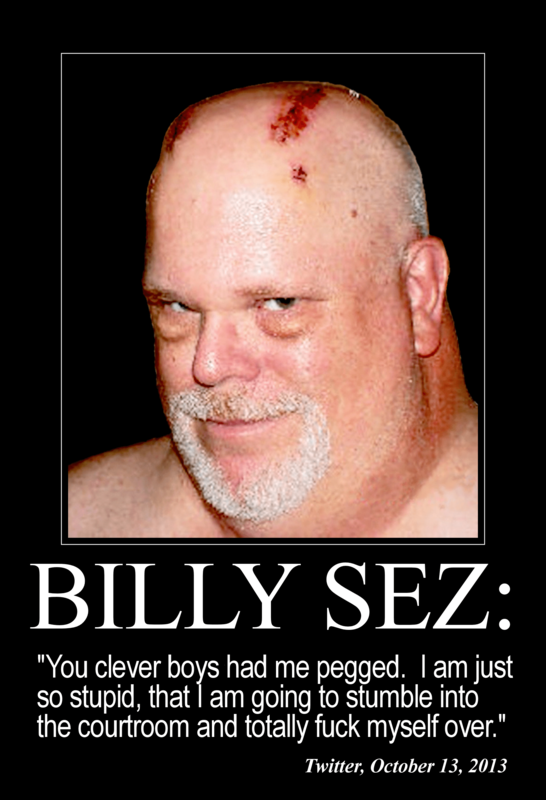 By the way, a big congratulations on getting “Billy Sez” into the Google. It will be nice for folks who google Schmalfeldt to see his own words. It seems Bill is unaware that the Post Office has been consolidating their sorting facilities since late 2012. Thus his mail likely gets processed 10 miles or so away in Baltimore for the past couple of years… A simple phone call to the local post office can easily verify this. The U.S. Postal Service today announced plans to move ahead with a modified plan to consolidate its network of 461 mail processing locations in phases. The first phase of activities will result in up to 140 consolidations through February of 2013. Unless the circumstances of the Postal Service change in the interim, a second and final phase of 89 consolidations is currently scheduled to begin in February of 2014. Oh, you and your “research” and “facts” and “actually bothering to look at things.” Pure legal trickery! First, this letter is clearly a forgery, because the signature looks too much like Bill’s, it was mailed from a location too similar to Bill’s and was printed on a printer like Bill’s. Second, the phone call before Thanksgiving wasn’t him because it came from a prank call site and _anyone_ who had an audio clip of Bill saying “you don’t know me but I’m coming to dinner”, in Bill’s voice, could have uploaded it. So clearly somebody recorded Bill without his knowledge and used that to prank Hoge. Coulda been anyone. Defense to what, exactly? This letter is not the subject of his upcoming trial, another letter is. A letter that he helpfully confessed to sending. Good point, but I believe this letter was entered into evidence at that hearing, if it is a forgery that helps Bill, if it is genuine then Bill’s denials make him look even worse. Yes, that is possible. The judge hasn’t googled him, so there is still room for him to fall in the judge’s eyes. And this letter is less “morally defensible” than his “I just wanted to help” letter is. OK, it wasn’t help, he wanted to bypass the court order and thought he had a wedge, and his tweets that week destroy his claims of noble intentions, but the judge doesn’t know that. Ah, but in the Court of The Poisoned Mind, Blob is making his summation in the Case of the Obviously Forged Letter and HOOOOOOOOOOOOOOOOOOOOGE!!! is mere moments from being condemned to death. You can’t expect the Oops I Did It Again matter to distract from something so important to humanity, can you? You only used 20 Os. For some reason I’ve got an image of Jon Lovitz going, “It’s TOO realistic! Yeah, that’s the ticket!” going through my mind right now. Bill enters this letter into evidence at trial, the prosecutor will hug himself– because he can not do a happy dance in court–and experienced courtroom observers jaws will hit the floor. And annoying those of us who understand Yeats. A woman of many talents and interests. Plus, a Harry Dresden fan, which is icing on the cake! Just Dresden or Butcher in general? I don’t know about Dianna, but for me it’s Dresden. Didn’t really care for the Codex series. I just ran across this post by Vox Day, and thought I’d post an excerpt here. It seems relevant. “Remember, SJWs ALWAYS LIE. Deceit is not second nature to them, it is their first and most reliable instinct. They will lie when they do not have to. They will lie when there is no reason to. They will lie when their lies are easily detected. They will lie when their lies are bound to be exposed. They will lie and and dissemble and exaggerate and spin with such shameless abandon that the average individual will find it almost impossible to believe they are doing so. And because war is a thing of pretence, their deceitful nature makes them very successful in conflict as long as their enemy does not realize how deceitful they are, anticipate their inevitable pretenses, and take advantage of them. Sun Tzu says: “victory is to the side that excels in the foregoing matters.” That means that if you do not anticipate SJW deceit, if you are not proactively prepared to penetrate, expose, and defend against their lies, you will lose to them. But defeat is not inevitable, it’s not even likely, given the first element. Due to their deceitful and self-deceptive natures, SJWs neither know themselves nor their enemy. This ignorant self-delusion is significantly to our advantage. The problem conservatives have is that while they know themselves, they fix their eyes only on their own side and remain ignorant of the enemy. Thus the conservative “conquers, and the next time is defeated”. The conservative knows himself and mistakenly assumes that his enemy is just like him. Who cares if a major publication defamed a few young men? It appears the end always justifies the means when SJWs have a common goal. Being a SJW… means never having to say you’re sorry. Maryland Judicial Database seems to indicate that Kimberlin’s state case is closed again with a final judgment in favor of the defendants!